THE Electoral Commission has been unable to answer new questions on the pro-Brexit group that donated £435,000 to the DUP, due to the restrictive rules covering political donations in Northern Ireland. In February this year the DUP confirmed that the Constitutional Research Council had funded its Brexit campaign, which included a £282,000 advert reading "Take Back Control - Vote To Leave" in the Metro newspaper that circulates in Britain. The DUP also purchased nearly £100,000 worth of campaign merchandise in England, where political donors are usually declared, but the source of the donation remained secret in this case because the DUP is a political party based in Northern Ireland. The law that protects the identity of donors in Northern Ireland dates back to the violent era of the Troubles but controversially remains in place today. The Detail asked the Electoral Commission a series of questions about the Constitutional Research Council (CRC), including when it registered as a donor, which is required under law. The Electoral Commission, which regulates the funding and spending of political parties, indicated it could not answer the questions due to the secrecy laws in Northern Ireland. In a statement to The Detail a spokesperson for the UK Electoral Commission went on to repeat its call for reform: “You may wish to note that since 2005 the Electoral Commission has consistently called for an increase in transparency so that voters in Northern Ireland can access information on how political parties are funded." The CRC did not respond to queries from The Detail about its registration, while the DUP failed to comment. 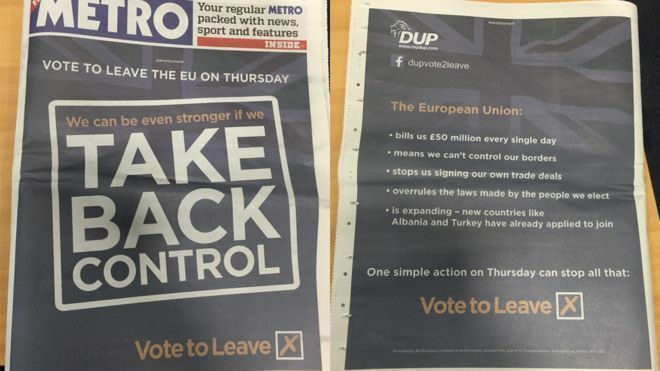 The DUP previously faced questions over its funding of the Metro newspaper advertisement, given that the publication does not distribute in Northern Ireland, but the party said it was entitled to campaign across the UK. In a further development, a fresh analysis of receipts on the DUP’s Brexit campaign, which the party supplied to the Electoral Commission here, shows details of how it paid a company in England for pro-Brexit merchandising ahead of the UK’s June 2016 referendum on EU membership. The receipt shows that the DUP paid almost £100,000 to the English branding company for what appears to be 100,000 window stickers, 50,000 badges, 15,000 plastic boards, 5,000 bags and 7,000 t-shirts. The EU referendum vote took place on June 23, 2016. Information on the commission's website shows that the invoice for these items was "incurred" on June 10 and it was paid on June 20, 2016. The DUP's four page Brexit advert in the Metro newspaper appeared on June 21, 2016. A separate receipt showing a DUP transaction with a company in Northern Ireland prior to the referendum showed the party spent just under £1,000 on 38,000 Brexit flyers. An additional £1,600 was paid to a second Northern Ireland firm involved in mail and marketing services. Little is known about the Constitutional Research Council (CRC) other than that it is led by Richard Cook, a former vice chairman of the Scottish Conservative and Unionist Party. It has been reported that the CRC is not a registered company, but has the status of an ‘unincorporated association’. Unincorporated associations are organisations set up through an agreement between a group of people who come together for a reason other than to make a profit. Unlike private businesses, they do not need to register at Companies House, while they can also be established without any cost. However unincorporated associations must register with the Electoral Commission within 30 days of making any political contributions of more than £25,000 in a calendar year. Failure to do so can result in fines of between £200 and £20,000. The Electoral Commission – created by government to oversee political funding - maintains a register of all unincorporated associations that make political contributions of over £25,000. Despite donating £435,000 to the DUP last year, the Constitutional Research Council does not appear on this list. We sent a series of Freedom of Information requests to the Electoral Commission to try and establish why the CRC was not on the list. In the event that the CRC's links to the Northern Ireland donor legislation had prevented it being named on the list, The Detail asked if the commission could confirm when the CRC had registered. In response to the queries about the CRC a spokesperson for the commission said: “There may be circumstances in which we would not publish the name of an unincorporated association as other legislation would prohibit us from doing so. The commission further underlined the need for a change in the law regarding political donations in Northern Ireland. It said: “You may wish to note that since 2005 the Electoral Commission has consistently called for an increase in transparency so that voters in Northern Ireland can access information on how political parties are funded. The commission concluded its correspondence by stating: “I realise that you may be disappointed by this response. The commission strives to be an open, transparent authority, but in some circumstances we cannot responsibly release requested information, and we ask for your understanding in this regard." In March The Detail revealed that prior to the Northern Ireland Assembly election, the DUP sought a delay in publication of information linked to the £435,000 donation, arguing such information should not be released close to an election. Brexit talks - a sequence or a staring contest?